We’ll start off with emphasizing that “growing” and “developing” are two distinct processes that are interlinked. For this reason, pediatricians will measure baby’s height, weight and other growth criteria but also ask parents about baby’s development – their movements, grasping abilities, eye contact, vocalizations and language development. While each baby has their own pace of development dictated by his or her genetic makeup and personality, there is a certain norm, a certain age in which we would expect to see certain developmental milestones reached. I will now try to expound on the major milestones with extra emphasis on the development of gross motor skills and adequate stimulation. Notice how the various areas of development are interconnected and see how we as parents can offer the kind of environment and stimulation that allows baby to realize his or her full developmental potential. Remember, development is not a linear process and babies might skip stages or acquire various motor abilities simultaneously. So, please refer to this short survey only as a general framework for understanding the principles of baby’s development. We’ll start at the beginning. When our baby is born we can still detect the physiological flexion in our baby from the time spent in the womb. At this point baby’s movements are spontaneous and graceful. They involve his whole body and are a continuation of the movements in the womb. His head turns from side to side. Consider the surface you lay him upon and make sure it is comfortable. Baby is driven by primary reaction at this stage. His eyesight isn’t fully developed yet and he can see mostly strong contrasting colors. Put your face at a 10-12 inch distance from baby’s and speak or sing softly. Babies show a preference for faces and remember your voices from the time spent in the womb. As time passes and stimulation offered continues (touch, sounds, gazing), baby’s development will continue. Our baby is already 2-months-old. Her head control has improved and she can hold her head in mid-line. The back and pelvis grow longer and straighten out on the surface, increasing the area baby can feel. At this point, baby can focus her gaze and smile intentionally in response to your smile. Give it a try. 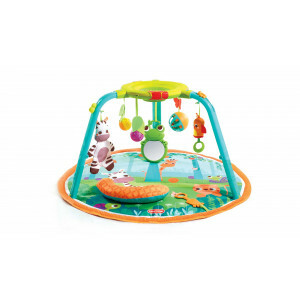 Lie on your tummy in the play area, put baby on her back and play with a colorful toy. You can gently place a toy in each hand and see how baby is able to hold it for a few seconds. As baby’s grows and develops, his large muscles (back, abdomen, and behind) and small muscles (fingers, eyes, feet) get stronger. We will see how he begins reaching out toward an object (note that the feet can also reach out – locate toys so that baby’s kicks move them or make them produce sounds). These initial grasping attempts will not be very accurate, but as time passes and baby practices, we will see more precision. This is one of the ways baby learns cause and effect as well as control over his environment. At this point, we might also see unintentional rolling over from tummy to back. Baby’s head is heavy and if she turns her gaze the body may follow, resulting in an unintentional rolling over. Often, this unintentional movement is accompanied by surprise or crying. As time passes, baby will initiate this action. Lying on her back, our baby is already practicing her stomach muscles by raising her feet and pushing her chin down. Hang the toys at various points. She will stretch her hands out in different directions, strengthening different muscles. A wider variety of experiences leads to more effective learning. The mid-line is becoming increasingly clear at this point in the way baby stretches limbs and brings her feet together. As baby reaches the 6-month brink, he also begins to pivot around himself. The strength in the arms and chest allows him to carry his weight on straight arms. He can now reach out to object with accuracy when lying on his back or tummy. 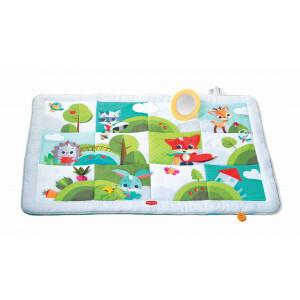 Place a toy at an angle from baby to encourage him to start turning in that direction. Our baby can now separate between the pelvis and shoulders movement in a way that allows her to turn onto her side and play. She can control rolling over from back to tummy and enjoys playing in tummy time for longer. When baby is lying on her back, we can see the beautiful connection between hands and feet. Baby will hold her knees or ankles and stretch her legs back and forth. Wonderful! This means she is getting to know her body, extend her muscles and sense her legs with hands and mouth. Soon after, you may see the first crawling attempts, which might initially lead baby backwards while on his chest (creeping). As in every motor learning process, the beginning can be challenging and inconsistent. Practice, providing an open and enabling environment, placing toys a little out of reach and plenty of encouragement can support its acquirement. Baby can now reach further, explore his surroundings and examine his boundaries. Your presence is essential. Be close and attentive. He is searching for your approval, collaboration and guidance. At about 8-months the muscles are strong enough to begin standing on all fours. Baby may rock herself back and forth. This is a very natural way of practicing to prepare for crawling on all fours and standing up, which will come later on. This rocking motion stimulates the vestibular senses (body sensation) and helps compress the bones and limb joints. Occasionally, we will also witness sitting up at this stage. From lying on the side, baby will lean on his hands and sit up. You can now place toys in a location that baby will reach after he is sitting up. Our baby is now strong enough to straighten his back and keep his balance. He is available to support himself to avoid falling forwards and later will also be able to avoid falling sideways. After that, he will develop the mechanism for avoiding falling backwards. Keep that in mind when setting up a safe playing environment for your sitting baby, paying extra attention to the back and sides. Sitting up supports the development of vocal abilities, creates a new field of vision and frees hands for more sophisticated play. The back and shoulder muscles are strong enough to stabilize the body and the hands and fingers are strong enough to play in a more intentional and advanced way - reaching, holding and releasing intentionally, pulling, turning and playing with both hands. Challenge your baby with games of cause and effect, taking things in and out of a container, playing together by rolling a ball. Raise the toys to baby’s shoulder level to encourage the back to straighten. From a steady sitting up position, baby will move to crawling, sometimes combining crawling on all-fours with creeping. The development is dynamic and takes place simultaneously. That’s natural. As baby turns 10-months-old, we will notice baby pulling up to supported standing positions – leaning on furniture, toys, etc. At first, baby will pull himself up clumsily, but the more he practices he has the better his ability will become. Pulling up into a standing position is a motoric development that gives the feet their new and all-important role – carrying the weight of the whole body. New challenges arise, like keeping balance on a narrow basis and handling a new height. Luckily enough, the rewards are great: standing opens up a new field of vision and presents new intriguing motor challenges, and is, of course, the starting point for walking. After baby gains confidence standing up, she’ll begin cruising around furniture and toys. Make sure that baby’s play environment is safe for this stage of practice, which will at first include walking sideways and later walking forwards and rotating the body. After a while, baby will let go and practice unsupported standing. Now our baby is ready to start walking and move into the next stage – being a toddler.